The next color challenge I completed was using Regal Rose, Blushing Bride and Old Olive. For this card, I used the Manhattan Flowers set. I stamped the rose in Basic Black ink on Watercolor paper. Next, using my markers and blender pen, I colored it in. I used a technique presented on SplitcoastStampers by Karen Barber. The technique is called Marker Layering. 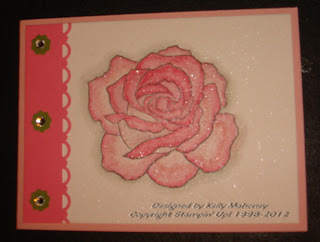 I finished the card by spraying on some Vanilla Shimmer Smooch Spritz. Also, just a note, I did use Basic Black ink instead of Staz On only because my Staz on pad really needs to be reinked. I was extremely careful to stay away from the lines so they would not run too much when I was blending the colors.